Fr. 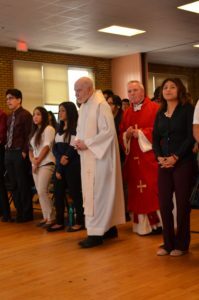 John Milton, CSV, celebrates 65 years of religious life this year as well as 60 years of priesthood, but this Viatorian can be described as “evergreen,” or one who is continuously self-renewing. 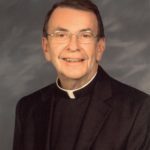 All but five years of his ministry have been spent teaching physics, including 20 years at Saint Viator High School and another 24 years as a professor at De Paul University in Chicago. Since his retirement in 2011, Fr. Milton has served as a science consultant to faculty members at Cristo Rey St. Martin College Prep, where he helped obtain lab equipment through his network of physics colleagues and helped to start the school’s first AP physics course. At the opening of this school year, Fr. Milton played a key role when he located 20 pairs of protective glasses for students to watch part of the rare total eclipse. Classes rotated in and out of the building, sharing the glasses with classmates as they experienced this once-in-a-lifetime event. Fr. Milton is even stepping up his involvement to go beyond consulting on labs with teachers. 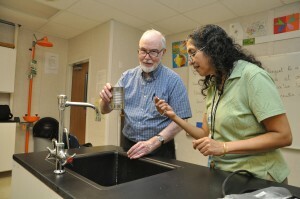 This year, as a result of the growing numbers of students taking science — and in particular AP physics — he will work in the classroom, along side Ms. Kumkum Bonnerjee. At an open house of the school’s new facility, expected to open in April, 2018, Fr. Milton was among the first Viatorians invited to see its progress. “It’s impressive,” Fr. Milton said. “All of the science labs are in one wing and with the added space will allow them to offer AP chemistry and biology as well as AP physics. Being involved with the school and helping prepare its students for college and beyond, gives Fr. Milton renewed energy.